In september of 2003, Norwegian Cruise Line ordered a class of two ships, based on the 'Star-class that had just been a transferred order from Star Cruises the years before. Like Star Cruises, NCL was owned by the Malaysian company Genting and that company decided that the large newbuildings planned for Star Cruises would be better off in the international fleet, that was NCL. The 'Star'-class was two ships, Norwegian Star that entered service in 2001 and Norwegian Dawn who came one year later. Although ships for NCL now, they had been intended for the Asian market. The newly ordered ships for NCL in 2003 would de built to the same profile, but with a different inner layout, making them technically a new class. As the first ship entered service in 2005 as Norwegian Jewel, the updated class of ships became the 'Jewel'-class. Her sistership was going to enter service in 2006 for NCL America, another brand created by NCL for American-flagged cruising around Hawaii and her name was Pride Of Hawaii. The ships of the class were at that moment the largest ships ever ordered for NCL. 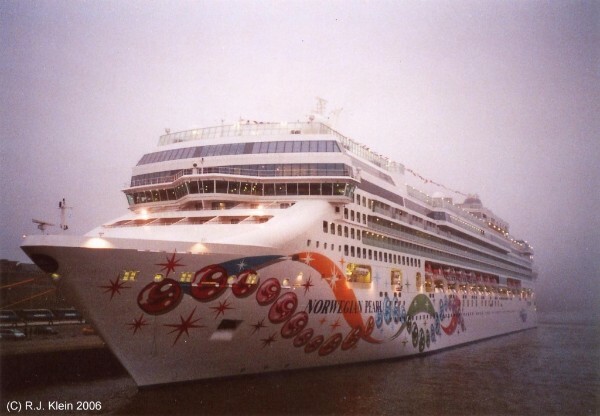 During the introduction of the new ships, NCL ordered two more ships in the same class on the 24th of december in 2004, introduced as Norwegian Pearl in 2006 and Norwegian Gem in 2007. With these six new ships, NCL hoped to turn around their financial situation as they suffered difficulties with their older, outdated fleet. Below, Norwegian Pearl is shown just after her second arrival to the port of Rotterdam at the 30th of november 2006. Especially in the early morning, a dence fog was overhanging the city. As the thirth member in the 'Jewel'-class, Norwegian Pearl was laid down at the 4th of october of 2005 in the buildingshed of Jos L. Meyer's wharf at Papenburg, northern Germany. She then was only known as yardnumber 669, by the way. The ship was going to measure some 93.503 tons with a lenght of 294,13 meters, a width of 32,20 meters and a draft of 8,23 meters. Her 15 decks gave accomodation to 2394 passengers and 1099 crewmembers. The ship is propelled by two ABB-designed Azipod thrusters and has also threeBrunvoll-designed bowthrusters installed for better manouverability. She can split the seas at a speed of 25 knots maximum. Norwegian Pearl floated out of her buildingshed at the 15th of october of 2006, diverted to the fitting out berth so she could be delivered complete to NCL at the following 28th of november. In between, she sailed her trials from the Eemshaven in The Netherlands and to get there she had to pass the Ems River passage from Papenburg at november the 4th. Normally a very impressive sight, as it is a shallow river not meant for these huge monster cruiseships. Constant dredging keeps the river deep enough, but to sail the river safely, a powercable has also to be shut down while the ships pass. It didn't. And it is not just a small little powercable thingie, it is one of the main European highways of power. The ship hit the cable, causing a massive power-outrage in northern Germany first, which then spread out to a small dozen of countries, as far as Morocco in northern Africa. Quite an entrance for the new ship, creating headlines across the continent. She was the first ship to be taken into service after NCL changed their logo to that of the lonely white fish swimming upstream while the other blue fishes go downstream. This also comes back in the ships carpeting, as the white fish always swims towards the bow. This makes it easier to find one's way around the ships of NCL. The most innovative space aboard is definitely the Bliss Ultra Lounge. This lounge is done in Asian style, complete with golden statues of dragons and snakes and even a couple of loungebeds. Also here are the two pairs of bowling-alleys, which are said to be the first aboard any cruiseship. Not really true, as they have been around since the 1912-built liner France, owned by the French Line. Here, the bowlingalleys were fitted at one of the outside decks for extra entertainment, which was kinda less then we take for granted nowadays. Although the Bliss Ultra Lounge is a little more classic and dark in tone, the most used colours overall are blue, turquase and lighter blue although the ship misses the bright neon-style of for example Costa Cruises or Carnival. The company really caters for families and young adults and accordingly, the Norwegian Pearl has a very large space dedicated to teenagers and children aboard.In the first season, the ships theater hosted a show especially made for the ship named 'Tubes', a true broadway style show with an old-school New York hiphop vibe. Another classic looking place aboard is the ships main diningroom, the Summer Palace. This restaurants has hints of influences from ancient Rome and Greece. There is a split staircase for dramatic entrances, several classic statues and flowers giving a more contemporary style to the place. Thanks to the Freestyle concept of NCL, there are more places to dine though, aboard there are twelve restaurants to choose from. You can choose for American stakehouse, French, Asian, Italian or Japanese cuiseine for example. For some of these speciality restaurants a small fee has to be paid. The Norwegian Pearl is not called a ship but a 'resort' in the brochures of Norwegian Cruise Line and she introduced herself to me on a misty morning in the port of Rotterdam. She came here directly from the Eemshaven in the Northern part of the Netherlands, so it was her first port of call. She left Eemshaven with some people from travel-agencies, crewmembers from NCL and members from the international press on her way to Rotterdam where she arrived on the 29th of november. She stayed here overday and took off in the end of the afternoon to present her guest (this time really guests because they are not paying for the trip) a one-night cruise. The day after, she came back to Rotterdam, preparing for her first true voyage taking her to Southampton in England and finally Miami where she arrived to be named at december the 16th.Here, she was named by Rosie O'Donnell, an American actress and TV-personality. After the naming, the ship settled in for her first Caribbean season and afterwards she was mainly sailing the Caribbean, the Panama Canal and Alaska. She has seen a fair share of events throughout her carreer with many famous people walking her decks. Since 2012 for example, the ship is used by the legendary rockband KISS for their annual KISS Kruise, providing Crazy Nights for their fans. Maybe inspired by KISS, the American rockband Paramore also were present with their three-day Parahoy!, with the band playing two concerts aboard, next to interactions with their fans in 2014. Now known as a true Rockship, in february 2015 a special cruise was organized when the annual 'Shiprocked'-event was taking place. During this event, which also took place on NCL's private island Great Stirrup Quay, bands to the likes of Limp Bizkit, Black Label Society, Buckcherry and Chevelle performed. But the ship is not only 'the' ship to be for rockfans, as she was host to the 'Walker Stalker Cruise' in january of 2016, where fans of the comic 'The Walking Dead' (who are named Walker Stalkers) were able to meet their heroes to the likes of Norman Reedus, Jeffrey Dean Morgan, Katelyn Nacon, Michael Traynor and Alana Masterson among all other personages from the comic. In january of 2017, the ship was also the venue for the first 'Star Trek Cruise', where many actors from Star Trek were present, headlined by William Shatner. Due to big success, the cruise was repeated in january of 2018. Next to all those specially themed cruises, the ship was also used several times for television, starting in 2009 already when she was chosen by CNBC for their documentary 'Cruise Inc: Big Money On The High Seas'. Also, she was the venue for one episode of Impractical Jokers dubbed 'Cruisin' for a Bruisin', airing at may 7th 2015. On the 6th of april 2014, one of the ships crewmembers died during an attempted robbery on the Caribbean island of Roatan. Because of the incident, Norwegian Cruise Line cancelled all calles at Roatan for the rest of the year.